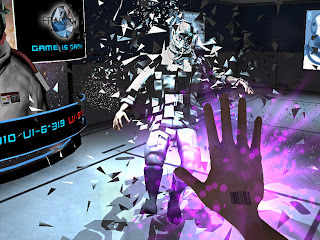 Fragment is a free sci-fi first person stealth action game developed by four students using the Unity Engine. The game’s idea is somewhat similar to Portal. As your character, you can create a fragment which is sort of like a portal that looks like you, or a hologram. You can move your fragment around like you would when controlling your own character, then at any time you can switch positions, between you and your fragment. With the use of the fragment ability you must go through and escape the facility you're stuck in by sneaking past or eliminating any threats in your path. There isn't much to talk about - alright graphics, sounds, animations and action. Though one thing I was disappointed about was the fact the AI only attacks if it sees you, if you cause an explosion they don't react or even look for the source of what happened, they just follow a strict path. Also the game itself is very short, 12 minutes should be enough to complete it. Also another thing to add on is the fact that the main menu isn't friendly to users with a 4:3 monitor. Fragment is a good game with some clever ideas and deserves a sequel with a longer lasting gameplay.